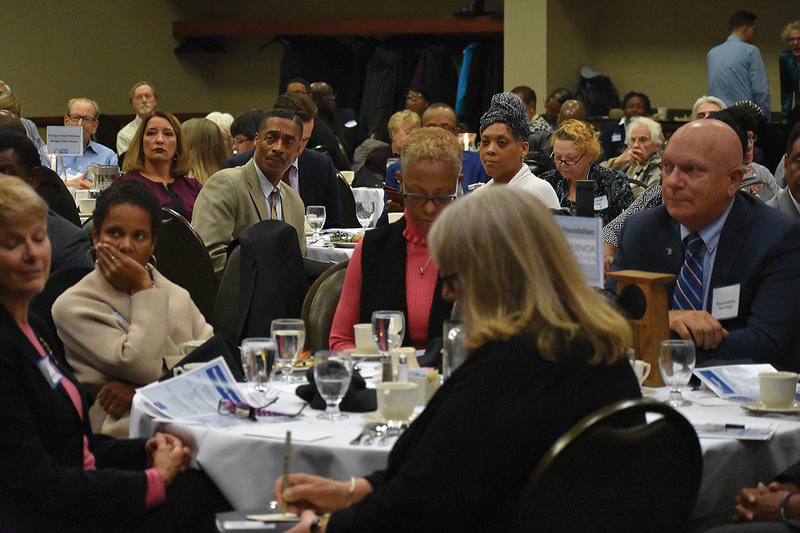 Solving the problem of how to get more people to get on board with criminal justice reform was the theme of the night at Safe & Just Michigan’s Annual Membership Meeting and dinner, held Thursday, Oct. 18 at the Radisson Hotel in Lansing. The event, attended by nearly 200 people, featured speakers Leon El-Alamin from Flint, who is the founder and executive director of the MADE Institute, and Ellen Buchman, who is a vice president of the communications lab The Opportunity Agenda in New York. 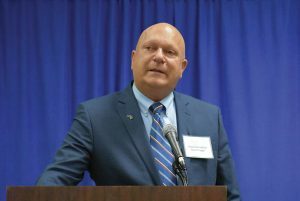 Also at the event, state Rep. Dave Pagel received the William G. Milliken Award for his efforts to advance criminal justice reform in Michigan. The event capped an eventful year for criminal justice reform in our state, Safe & Just Michigan’s Associate Director of Policy & Research John Cooper explained. It is one of few issues enjoying bipartisan support in Michigan during a time when few topics have managed to find common ground, which has made it possible to gain meaningful policy wins. 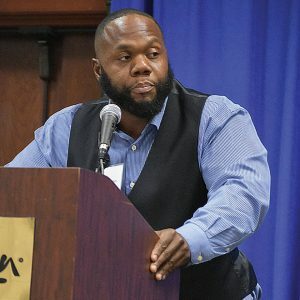 In the past year alone, Michigan has seen important criminal justice reforms, such as the passage of an objective parole law, the establishment of a “ban the box” policy on state jobs and state professional license applications and the creation of medical probation for people in poor health confined to county jails. But with over-incarceration still a major concern, and the state corrections budget still occupying $2 billion of the state budget annually, there are still many reforms needed. Changing the narrative of criminal justice reform is key to changing people’s opinions and making them receptive to policy reform. But getting people to change their minds on closely held beliefs about what will keep them safe can be a challenge — which is why Safe & Just Michigan invited two experts to share their knowledge with the audience. Leon El-Alamin, executive director at the MADE Institute, presents on how to change hearts and minds. El-Alamin and Buchman’s talk, titled “Moving hearts and minds toward reform,” began with El-Alamin sharing his own life story. El-Alamin grew up in Flint, where he saw few opportunities available to him as a young man. He followed the examples he saw others around him take and became involved in selling drugs, which led to a stay in prison. When he was released, El-Alamin made a conscious choice to return to the community he came from in order to repair the harm he had caused. But doing so wasn’t easy, as he quickly learned that employers, landlords and people in general held many prejudices against people like him who have a criminal record. That’s why El-Alamin eventually started his nonprofit, the MADE Institute. It mentors at-risk youth, re-integrates formerly incarcerated people into the community and teaches and employs them in building trades. These jobs are crucially needed opportunity for formerly incarcerated people, who often run into roadblocks when trying to find an employer willing to hire them. While many people are hesitant to extend a helping hand to the formerly incarcerated, they also believe in values such as redemption, hard work and fairness. By tapping into those values, we can start to get people to look at criminal justice reform through a new lens. Ellen Buchman, vice president at The Opportunity Agenda, speaks at the SJM 2018 Annual Membership Meeting and dinner. Buchman and El-Alamin discussed ways to effectively reach people skeptical about criminal justice reform and convince them to see the issue in another light. 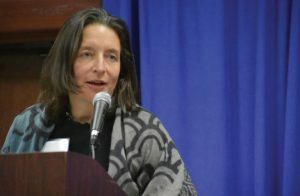 While many statistics prove the point that justice reform is needed, Buchman said mythbusting can often be counterproductive because people often choose to believe only the facts they want to believe. Also during the event, Safe & Just Michigan presented state Rep. David Pagel (R-Berrien Springs) with the William G. Milliken Award for his work on criminal justice reform. Pagel chairs the Appropriations subcommittee that oversees the corrections budget, and authored important reforms, including laws ending the ability of successor judges to veto parole decisions for parolable lifers and allowing the Department of Corrections to hire formerly incarcerated people. He also led a bipartisan effort to establish a special parole for medically frail prisoners. Rep. Pagel shared that his own opinions about criminal justice reform were changed because he took the time to visit prisons and to get to know the people who are confined in them. In particular, he was moved by getting to know one 70-year-old man who was incarcerated. The representative, who is finishing his last few months in office due to term limits, gave an emotional acceptance speech as he shared stories about his visits with incarcerated people and his work to make a difference through Michigan policy. He received a standing ovation from the near 200 guests in the room. Representative Dave Pagel received the 2018 Safe & Just Michigan William G. Milliken Award at the Annual Meeting and dinner. Despite Michigan’s recent successful criminal justice reforms, there is much more to do. There are additional strategies that will allow us to safely reduce the state’s reliance on incarceration – and to save precious taxpayer resources. We are thankful for everyone who attended the event last week. Together we can build a safer and more just Michigan. Safe & Just Michigan is overwhelmed with the support from event sponsors including Cascade Engineering, Jandernoa Foundation, and Resch Strategies. A special measure of gratitude is extended to the individuals, businesses, and organizations that sponsored an event table including A.R.R.O, Calder Group, Grassroots Midwest, Hope Network, Mike Vizena, Michigan Faith in Action, RecoveryPark, and the Social Justice Committee of the Unitarian Universalist Church of Greater Lansing.